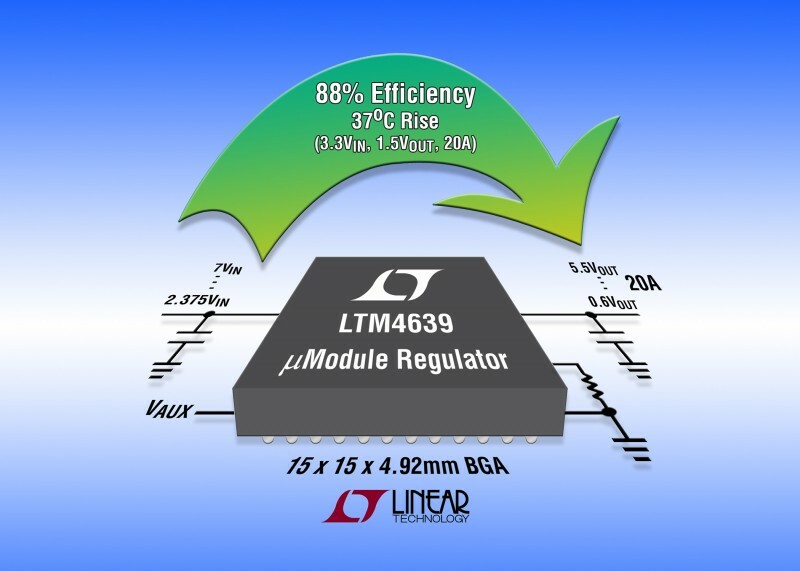 Linear Technology Corp. recently introduced the LTM2894 USB µModule (micromodule) reinforced isolator that guards against ground-to-ground voltage differentials and large common-mode transients. 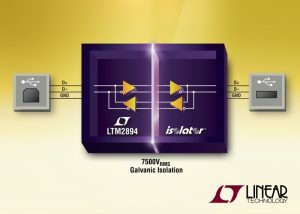 With a rugged interface and internal isolation, the LTM2894 is well suited for implementing USB in harsh environments where protection from high voltages is needed. 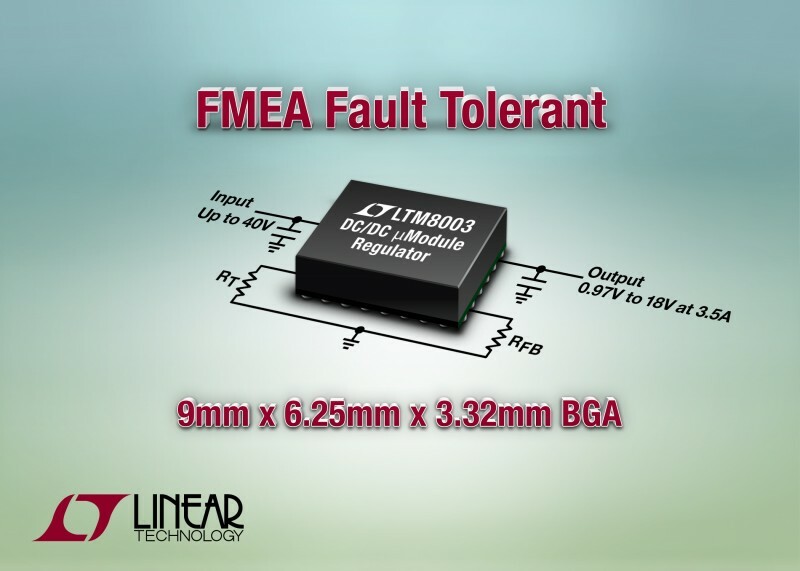 Linear Technology recently introduced the LTM8003 step-down DC/DC µModule regulator. 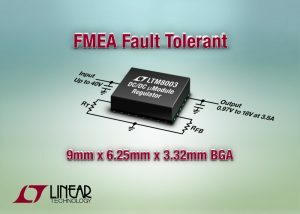 With a 40-V input voltage rating and 3.5 A of continuous output current, the LTM8003’s pinout is failure mode effects analysis (FMEA) compliant, so the output voltage remains at or below the regulation voltage in the event of a short-circuit to GND, a short-circuit to a nearby pin, or if a pin is left floating. The LTM8003 operates in four operation: Burst Mode, pulse skip mode, pulse skip mode with spread spectrum, and external synch mode. The quiescent current in Burst Mode operation is 25 µA (max), which makes the LTM8003 a good option for battery-operated systems. The LTM8003 starts at 1,000-piece pricing starts at $11.30 each in 1,000-piece quantities. Linear Technology recently announced the LTM4675 dual 9-A or single 18-A, µModule (micromodule) step-down DC/DC regulator with PMBus serial digital interface. It comes in a 11.9 mm × 16 mm × 3.51 mm BGA package. The I²C-based interface enables you to manage a system’s power condition and consumption. Calibrated and guaranteed from –40°C to 125°C, output DC voltage accuracy is ±0.5% over line and load regulation, and load current readback accuracy is ±2.5% maximum. The LTM4675—which features EEPROM, power MOSFETs, inductors and supporting components—dual analog control loops and precision mixed-signal circuitry. It is drop-in pin-compatible with the larger package (16 mm × 16 mm BGA) higher power dual 13A LTM4676A, eliminating layout changes so that system designers can easily switch between the devices during the prototype phase. This eliminates redesign of power circuits if power requirements change during board prototyping. The LTM4675 has applications in optical transport systems, datacom and telecom switches and routers, industrial test equipment, robotics, RAID and enterprise systems where energy costs, cooling and maintenance are critical and must be continuously and precisely measured. 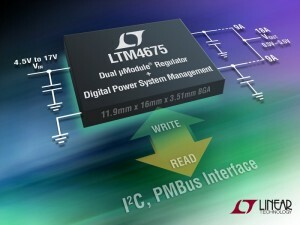 The LTM4675 operates from a 4.5-to-17-V input supply and steps down VIN to two outputs ranging from 0.5 to 5.5 V. Two channels can current share to provide up to 18 A (i.e., 9 A + 9 A as one output). Power-up turn-on time is 70 ms. To evaluate the performance of the LTM4675, the free LTpowerPlay GUI-based development system is available for download, and a USB-to-PMBus converter and demo kit are available. With ±0.5% maximum DC output error over temperature, ±2.5% current readback accuracy, integrated 16-bit delta-sigma ADC and EEPROM, the LTM4675 combines best-in-class analog switching regulator performance with precision mixed-signal data acquisition. At start-up, output voltages, switching frequency and channel phase angle assignments can be set by pin-strapping resistors. The LTM4675 internal operating temperature range is from –40°C to 125°C. It costs $24 in 1,000-piece units. The LTM4639—which includes an inductor, DC/DC controller, MOSFETs, and compensation circuitry—is housed in a 4.92-mm BGA package with a 15 mm × 15 mm footprint. For 3.3-V input to 1.5-V output conversion at 20-A load, efficiency is 88%, power loss is 3.9 W, and junction temperature rise above ambient temperature is 37°C. The micromodule regulator provides a precise output voltage regulation. Up to four devices can be paralleled for up to 80-A output while operating out-of-phase to reduce the number of input and output capacitors. The LTM4639’s input supply range is 2.375 to 7 V. For operation from 3.3 V and lower, a 5-V, low-power auxiliary supply is needed to bias internal circuitry. Output voltage ranges from 0.6 to 5.5 V with protection functions for overcurrent and overvoltage conditions. The LTM4639 is rated for operation from –40°C to 125°C. The 1,000-piece price is $19.45 each.